The Smoky Mountains have moderate year round weather which is perfect for hiking. In the Smokies there are a huge number of well maintained trails that can be used by hikers of all skill levels with beautiful topography, abundant wildlife, and plenty of Smoky Mountain history hikers can experience up close and in person all year long. The Great Smoky Mountains National Park is the most popular places to hike in the Smoky Mountain region. The Great Smoky Mountains national park is in fact the most popular National Park in the United States and it straddles both North Carolina and Tennessee and has an elevation range of more than 5,000 feet from the valleys to the highest peaks. The 800 plus square mile Great Smoky Mountains national park has more than 1,000 miles of maintained hiking trails, nature walks, manways and unimproved roads where hiking beginners, casual hikers or experienced professional hikers can hike for minutes, hours or even days in the most gentle or rugged terrain imaginable in the eastern United States. Hiking in The Great Smoky Mountains Park. Be prepared when hiking in the wilderness. Your Ad could be here! See how here. Middle Prong Trail in Tremont Area is Open: Agressive Bear Warning! The Boulevard Trail in Newfound Gap Area is Open: Agressive Bear Warning! Other great places to hike in the Smokies are the Cherokee National Forest, the Joyce Kilmer Memorial Forest, the Cheoh Mountains, the Shinning Rock Wilderness area, Chimney Rock State Park in North Carolina and the Cherokee Indian Reservation all located in North Carolina. Not to be outdone, the Tennessee Smokies offer fantastic year round hiking in numerous Tennessee state parks all within a few hours drive of the Smoky Mountains. Other major hiking trails of interest in the Great Smoky Mountains are the Benton MacKaye Trail and the North Carolina Mountains to Sea Trail. 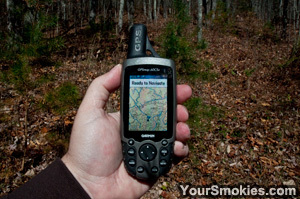 For more than 15 years we have been hiking trails in the Great Smoky Mountains National Park and gathering information and taking photographs along the way. What is remarkable about hiking on trails in the Smokies National Park is every time you walk on a trail, you see something different. Year round the biodiversity of the GSMNP will surround and amaze you. From tiny plants and moss growing on a rock by the side of a trail to a huge 400 year old tulip tree towering over the over you, every footstep on your journey in the park will unfold the beauty of nature. Surprises await you on every twist and turn of every hiking trail in the national park. You just have to open your eyes, open your heart and listen carefully to the world of nature. Since the Great Smoky Mountains is a temperate rainforest, most everywhere you look there is lush plant growth and there are creeks, streams and rivers with stunning waterfalls most of which can only be seen by hiking into the woods. Many hiking trails meander around streams and creeks in the national park and may criss cross streams so hikers may find themselves walking across foot brides or hopping from rock to rock to stay dry. See our complete list of hiking trails in the Great Smoky Mountains national park. We have hiked and listed every section of the Appalachian trail in the Great Smoky Mountains national park starting at the Fontana Dam trailhead in North Carolina all the way through to Davenport Gap Between Big Creek and Cosby. Some of the most stunning scenery and secluded places in the Great Smoky Mountains national park are along stretches of the Appalachian Trail. The Benton MacKaye hiking trail is nearly 300 miles long starting in Davenport Gap in the North Eastern section of the Great Smoky Mountains national park and ending up at Springer Mountain in Georgia. The Benton MacKaye hiking trail includes more than 90 miles of hiking trails in the Great Smoky Mountains national park passing through some of the most remote areas of the park. Besides in GSM National Park, the Benton MacKaye trail also runs through 8 federally designated Wilderness and Wilderness Study Areas and some of the most secluded and quiet backcountry of Georgia, North Carolina and Tennessee. One of the most difficult stretches of the Benton MacKaye hiking trail is the Georgia Loop which is a 55-mile triangle and is known as "toughest hike in Georgia" although day hiking some stretches of the BMT in the GSMNP is extremely difficult yet rewarding. All stretches of the Benton MacKaye trail that run through the GSMNP are listed in the regular hiking trail listings. Less well known as the hiking trails of the Great Smoky Mountains National park system but equally impressive in size is the Mountains to Sea Trail (MST) of North Carolina. The North Carolina General Assembly passed the North Carolina Trails System Act in 1973 so that there would be a foot trial that would stretch across the entire state of North Carolina from the mountains all the way to the Atlantic Ocean. The Mountains to Sea Trail is more than 935 miles long and consists of hiking paths, bike routes and roads. This impressive trail starts right in the heart of the Great Smoky Mountains National Park at the highest point in the Eastern US, Clingmans Dome and winds a few miles down the Appalachian Trail through 6 backcountry campsites in the GSMNP and out Newfound Gap Road (US 441) where it will eventually end up at the Jockey's Ridge State Park right by the Atlantic Ocean. Just as fitting as starting in the highest point in the Eastern US, the final footsteps you take on the Mountains to Sea Trail are in the Jockey's Ridge State Park at the highest sand dune on the east coast reaching a height of 140 feet. While we have hiked much of the Mountains to Sea Trail complete Mountains to Sea Hiking Trail information and maps can be found at the Friends of the Mountains To Sea Trail web site. These live hiking and Great Smoky Mountains updates including information about the Great Smoky Mountains National park, weather and road conditions in the Smokies come to you via our Smokies Hiker Twitter account often via text messages on a phone so please excuse any typos. A book that I would recommend for hiking in the park is the Day hikers guide to all the trails in the Smoky Mountains. Looking to hike with local hiking clubs in the Smoky Mountains? 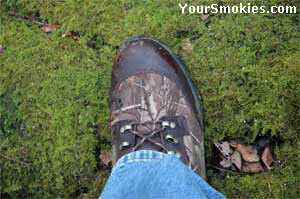 We have clubs in both North Carolina and Tennessee on the Your Smokies Smoky Mountains local hiking clubs page. Want to get a Discount on a Dollywood Cabin or a secluded cabin in the Mountains? What about a comfortable hotel room or do you want to spoil yourself by staying in a resort? What every you choose you get a special discount by booking here! Cheap Dollywood Tickets and 59 other discounts for White Water Rafting, Ober Gatlinburg, Tubing, Zip Lining, Alpine Coasters, Kayaking, Titanic, Helicopters, Go Carts, and Island Attractions. One stop shopping for the Smokies! Want cheap tickets to Dixie Stampede and great shows such as Lumberjack Feud, Country Tonite’s regular shows and special concerts, Wonders of Magic at WonderWorks and Murder Mystery Theater? You get discounts to 23 shows!